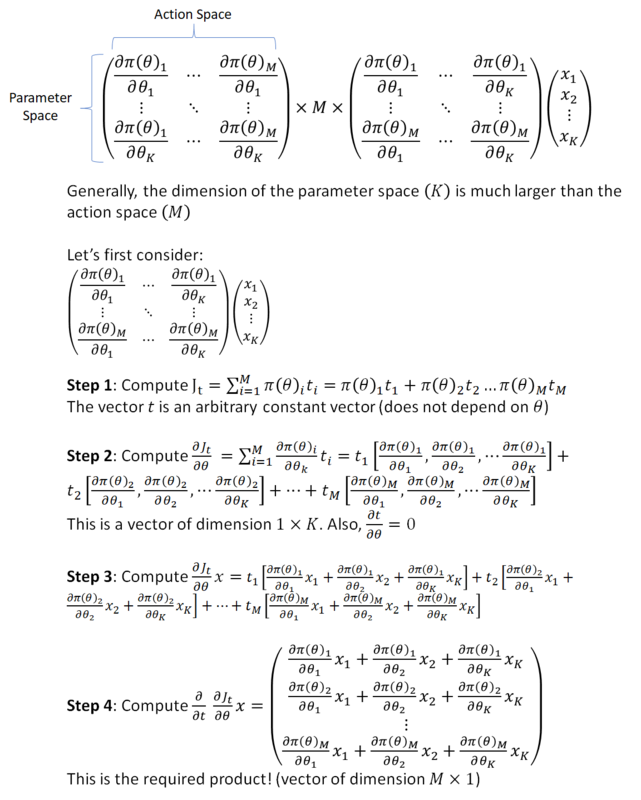 This problem is solved by performing stochastic gradient ascent on the policy parameters. For more details, refer to the excellent lecture slides on “Advanced Policy Gradient Methods” as part of the Reinforcement Learning class at UC Berkeley. As a side note, I applaud the recent trend in academia to make class lecture notes at top universities available to everyone. This, accompanied by a similar trend in research to make code for new machine learning algorithms available is making it possible for anyone willing to put in the time and effort to master latest advances in machine learning. This spirit of openness will make the field accessible to talented minds all over the world who may lack the means to go to Stanford or Berkeley and help address the growing mismatch between the supply of and demand for machine learning practitioners. The problem is that this approach offers no principled way to choose the right step size. If the step size is too big, the optimization may miss the minimum. If the step is too small, progress may be very slow. Standard machine learning methods address this problem by using automatic learning rate adjustment such as the Adam optimizer. However as illustrated in the lecture slides, the problem with the policy gradient methods is that small changes to the policy network parameters can cause unexpectedly large changes in the policy output (action probabilities). TRPO offers a mathematically principled approach to this problem by re-framing the optimization problem as a constrained optimization whose solution is guaranteed to result in an improved policy. For details, refer to the lecture slides and the original TRPO paper. There are many PyTorch implementations of TRPO available. I’m using this one – https://github.com/Khrylx/PyTorch-RL. PyTorch is my favorite machine learning library. Someone I know recently said – “Looking at TensorFlow code gives me a headache, using PyTorch makes me smile”. I agree with that sentiment :-). Parts of this code took me considerable effort to understand, particularly the proof of the fast method to calculate the Fisher vector product and its PyTorch implementation. The main purpose of this post is to offer explanations for the math and code so that it will be easier for you to follow. I’ll focus on the TRPO step and assume you already understand how to calculate value functions, compute advantages and other standard reinforcement learning techniques that are not specific to TRPO. refers to the output of the network (at the iteration) with parameters , representing a probability distribution over the action space. is short for , the subscript may be dropped in some places below as the dependence of the policy on the network parameters is implicit. Since and hence is fixed (at the end of iteration ), the only variable in the formula above is . Therefore, while calculating derivatives using autograd, we must detach from the computation graph. The summation is over the elements of the dimensional vector, the output of the policy network. # calling .data detaches action_prob0 from the graph, so it will not be part of the gradient computation. # Also, starting PyTorch 0.4, the Variable wrapper is no longer needed. This gradient can be readily computed as the state-action sequence under the current policy is already available. The code to calculate the loss and gradient is shown below. We compute the policy gradient both using autograd and the formula above. # Formula for loss. Need to exponentiate the log prob to get prob. # in the policy net. Here and . The first two terms in the expansion for KL distance vanish – the first term because the KL distance between two identical distributions is 0 and the second term because the KL distance achieves a minimum at (since KL distance is a distance, it can’t be lower than 0). Thus the first derivative of at must be 0. 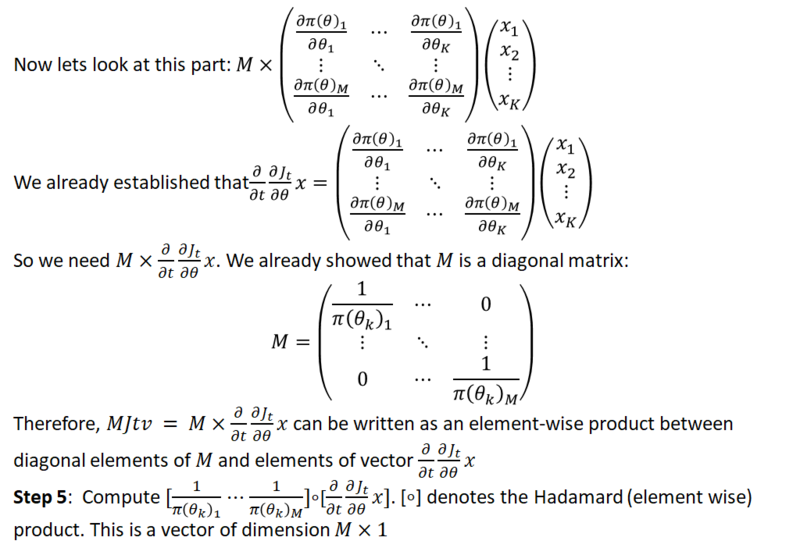 To avoid getting lost in a sea of symbols, lets look at the dimensions of the vectors in the expression above. is the gradient of the loss wrt the policy network parameters, and hence must have dimension equal to the number of parameters. Thus is a vector. being the parameter vector is also . Thus, is a scalar quantity. Similarly, the expression in the constraint has dimensions . Thus, the direction along which we must search for the new policy parameters is given by solving . Now we must determine how far to move along this direction so that the constraint is satisfied. Let this distance be denoted by . Thus, . Substituting this in the expression for KL constraint, we get , and thus . The product of and gives the optimal step to update . This mathematical principled method to compute the step size and direction is the major contribution of TRPO. Compare this with the ad hoc “learning rate schedule” typically used in training neural networks. In practice, since both the loss function and the KL divergence are non-linear functions of the parameter vector (and thus depart from the linear/quadratic approximations used to compute the step) a line search is performed to find the largest fraction of the maximum step size that leads to a decrease in the loss function. The matrix is a matrix where K is the total number of parameters in the policy net and easily be in the 10’s of thousands. To store this matrix and compute its inverse is very expensive. Note however that we are interested in the matrix-vector product , not the matrix by itself. This product can be calculated using conjugate gradient techniques which require repeated calculations of . is a vector that changes every conjugate gradient iteration. This simplifies matters, however calculating the Hessian matrix itself is a problem for autograd because its automatic differentiation feature is designed to calculate the derivative of a scalar wrt a vector, whereas the Hessian matrix involves the derivative of a vector (the derivative of the loss wrt the policy parameters) wrt a vector (policy parameters). One could of course loop over each element of the vector (code shown below), however this would be very slow, and require a lot of storage to store a Hessian matrix where is a large number (in the thousands). # now compute the derivative again. Is this the best we can do? Turns out that by doing some math in advance, we can save some computation time. From now on, we’ll refer by or just . Recall that the KL distance is a function of the action probability distribution output by the policy net whose parameters are specified by . represents the network output at iteration and is a fixed quantity. Here is a vector and is a vector. Thus is a vector, as we would expect to be. The first term vanishes at (refer to the Taylor series expansion of the KL distance above for an explanation). You may wonder why did not vanish in equation 12 above. This is because we are not evaluating the expression at until we take the second derivative. This is the same reason why the second derivative of at is 2 while the first derivative at is 0. Now let’s look at the middle term in this expression which can be evaluated analytically. Here, denotes the component of the vector. This method turns out to be about 20% faster than the direct method. This is largely because we are calculating the derivatives of the actions with respect to the network parameters instead of with respect to the KL distance, which is a complex function of the actions. This is a good example of how doing some math in advance yields decent speed-ups over relying on software to do all the derivative calculation. That’s it! Hope this post will help you with understanding the implementation of TRPO. I welcome your comments/feedback. i have a question about solving the differentiating wrt s of equation (9) and setting to 0, why the search direction is given by Hs=g? where is lambda? Is g = 1/(lambda)*g? Lambda is a scalar, so it doesn’t affect the search direction vector. The size of the search vector is computed in the next step. Makes sense? yes, I understand that. Thanks for your reply! I have a question. Why we need v * damping this part in last return JTMJv + v * damping? I think just JTMJv is answer. I have one question. why we need damping? I think just JTMJv is ok. why we return JTMJv + v * damping like this?